The Neutrogena Hydro Boost line brings facial hydration to body care. Warmer weather is fast approaching and I decided to change my lotions and try this particular product out. I'm already loving the facial gel cream from this brand and I said to myself, "If it feels amazing on my face, it must be the same result on my body." I was right all along and I'm not going to go back to my previous lotion. 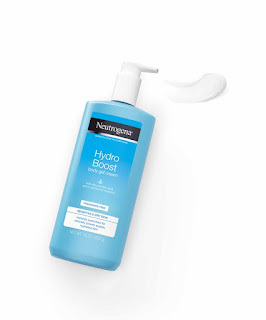 The Neutrogena Hydro Boost Body Gel Cream is a ultra-light gel-cream which is powered by hyaluronic acid. Hyaluronic acid is capable of holding 1000x its weight in water. This lotion comes in a beautiful bottle that is light blue colour and has a pump on the top. It is not like other lotions' bottle because this one is a twist and lock. It is dermatologist recommended and it has 400ml (UK) and 453g (North America) of product per bottle. This product comes in a fragrance and fragrance-free version. The bottle which is for normal to dry skin has fragrance in it while the fragrance-free bottle its for sensitive to dry skin. I bought the fragrance-free because I have eczema prone skin. When I put this on my skin it feels so soft and supple. The gel-cream texture holds its shape and a dollop is all you need to cover one part of your body area. The redness and dryness immediately disappeared after one week and my skin looks healthy again. This product is oil-free, dye-free, and has no alcohol in it. I found this in my local Boots store for £5.99. I know that it was recently release oversea in America for $16 -$18. I think its worth its price because the lotion feels luxurious, it also feels like a high-end product, and its affordable. Thanks for sharing your opinion, I've heard of this product before but wasn't sure if it was worth buying. Neutrogena is a wonderful brand and quite affordable when you take into account the quality of the product. I am not very good at looking after my skin and I don't on many lotions, but what I do own (and use occasionally) is Neutrogena brand. I actually trust the Neutrogena brand now. I didn't before. I love this brand so much and your review makes me want to buy this right now x) Thanks for sharing.